Artist impression of energy meters used in the new study. Credit: Amphiro AG. The average American’s shower water usage is 17.2 gallons (65 liters) with the average shower length being 8.2 minutes. That adds up to 21,216 gallons (80,300 liters) for a family of four every year — presuming that the family members shower daily (which most Americans do) and the shower doesn’t last more than eight minutes. Well, that’s a lot of water! While a lot of people are aware that they should use their water more efficiently, help doing so would be beneficial. 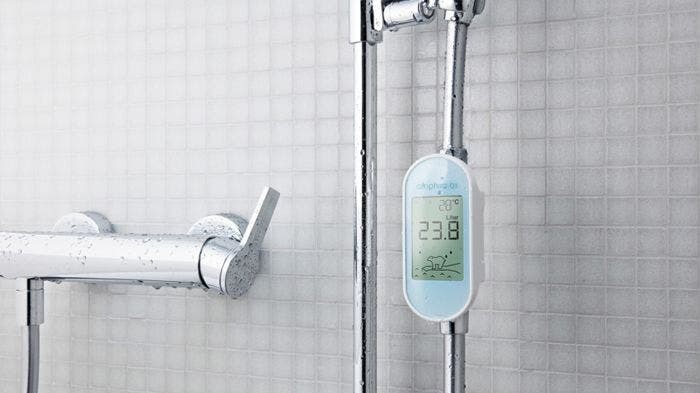 Verena Tiefenbeck and colleagues at the Swiss Federal Institute of Technology in Zurich may have found the solution: a simple gadget that shows real-time data about a shower’s energy usage. The researchers placed shower meters in bathrooms at six hotels. Some of the meters only displayed the water temperature, while the rest also showed real-time information about water and energy consumption, alongside an animation of a polar bear on a melting ice floe. The hotel guests were not aware they were participating in an experiment, nor were they responsible for the water bills. Nevertheless, the smart meters seem to have made an impression on them: guests who showered using meters that provide instantaneous feedback used 11.4% less energy, on average, than the guests who did not have access to this information. As such, the study published in Nature Energy suggests that these sort of meters could cut residential water use. “Feedback interventions have proved to be effective at promoting energy conservation behavior, and digital technologies have the potential to make interventions more powerful and scalable. In particular, real-time feedback on a specific, energy-intensive activity may induce considerable behavior change and savings,” the authors wrote. If you really want to make an impact on your household’s energy usage, you might also want to consider changing your shower habits as well. For instance, cutting down on showers if you’re a daily user could add considerably to your energy savings — and it might also improve your health. Frequent showering scrubs off oil (sebum) naturally produced from your skin’s sebaceous glands, which holds in moisture and keeps your skin pliable, reducing the risk of abrasion, cracks, and cuts. Sebum is also the food source for a slew of beneficial microorganisms, many of which die with every shower. With less sebum, your skin is also more prone to cracking and abrasion, which create orifices where harmful bacteria can lurk. Research on immunology suggests that dysfunction in the microbiome might contribute to a host of autoimmune diseases, including diabetes, rheumatoid arthritis, and multiple sclerosis. Bearing this in mind, perhaps you can get away with showering every other day, instead. In any event, don’t let yourself be shamed by other people for not showering daily — after all, daily showers started as a marketing ploy. Gizmodo previously reported how, at the turn of the 20th century, “the advertising industry had to create pseudoscientific maladies like ‘bad breath’ and ‘body odor,'” in order to sell products like “toilet soap” and Listerine to Americans.